I've spent the last several weeks working on some interesting portfolio survival research with my son and daughter, so my posts have been a bit few and far between. My apologies. Cary and I realized one day this summer, over a local craft beer after a round of sporting clays, that retirement portfolio survival and the medical research he does are largely the same research problem. I hope to have something here on my blog about our findings in a few weeks. In the meantime, here are some thoughts about portfolio survival in general. Longevity risk is the risk that a retiree will outlive his or her retirement savings. It develops in four stages as we make decisions about funding retirement. Let’s consider those risks by imagining a retiree who splits his retirement savings portfolio in half on the day he retires. The first "legacy" portfolio is intended for his heirs and the second “funding” portfolio is intended to fund his retirement expenses. To simplify the example, let’s assume he invests both identically in the same 40%-equity index fund on the same day. The only difference between the funding portfolio and the legacy portfolio is that he will spend annually from the funding portfolio and then re-balance it to 40% equities. The legacy portfolio will remain untouched to be left to his estate. A retiree can pretty much avoid longevity risk altogether by purchasing life annuities or TIPS bonds. There are plenty of good reasons to invest at least some of our savings in stocks and bonds, though, and that decision leads to the first risk, known as market risk. Market risk refers to the volatility of stock prices over time. Once we invest in risky assets like stocks, outliving our savings becomes a possibility. We can mitigate market risk by reducing our equity exposure or we can completely eliminate it, by purchasing life annuities or TIPS bonds. Our imaginary retiree has decided to mitigate market risk in both portfolios by investing only 40% in equities, but he has not avoided market risk altogether. If this retiree never spends from or saves to either portfolio, those portfolios will have equal values at the end of retirement. We don't know what that value will be, however, because both are exposed to unpredictable market risk. We only know that they will be exposed to identical market risk and that their "terminal value", or value at the end of life, will be the same. When a retiree begins to spend from her funding portfolio, the outcomes of those two portfolios go their separate ways. No matter how little our retiree spends each year, so long as there is net spending, there is no future in which the terminal value of the legacy portfolio will not be larger than the terminal value of the funding portfolio at the end of retirement for two reasons. The first cause is obvious – her funding portfolio will be smaller because she is spending some of it – but the second cause, path-dependent risk, can make her legacy portfolio's terminal value larger or smaller. The funding portfolio will always, however, have less value than her legacy portfolio, again because she is spending some wealth and never saving, but path-dependent risk can leave the funding portfolio fatter or thinner than it would have been with no path-dependent risk. Let me provide a quick example to explain path dependence. Assume that over the next five years, the stock market will provide the following returns in the following order: 5%, -7%, 9%, 3% and 4%. If we invest $1,000 in this market at the beginning and neither buy nor sell additional shares, we will end up with $1,140 five years later, no matter which order those returns occur. If we spend $30 at the beginning of each of the five years, however, the order of returns does matter. There are 120 different ways (5 factorial) those five returns can be ordered and each will provide a different outcome. The outcomes will range from $966 to $988, but always less than $1,140. Once we spend from or save to a volatile portfolio, the outcome is path-dependent. Note that in none of these 120 permutations is our account balance depleted. Path dependence isn't the same as risk of ruin and if we are only spending 3% annually ($30), it is very unlikely that we will exhaust our savings. Some refer to path dependence as “sequence of returns risk” but the term isn’t always used in that way, so I prefer to avoid it whenever possible. If returns are experienced with the highest gains early in retirement and the lowest gains toward the end, this path dependence helps our portfolios over time and if returns are experienced with the worst returns early in retirement, path dependence hurts our portfolio. The best possible outcome is achieved when our market returns are ordered from best to worst. The worst possible outcome is the reverse. With 30 years of annual market returns over a long retirement, the odds of experiencing the best or worst outcome are literally astronomical (1 in 30 factorial, each – there are fewer than 30 factorial stars in the visible universe). The source of path-dependent risk is selling in the spending phase of retirement finance and buying in the accumulation phase. We have no idea what price we will receive for the securities we will sell (or buy) in the future and that price risk is path-dependent. TIPS bond ladders held to maturity and life annuities have no path dependence risk because we know their future values relatively accurately. 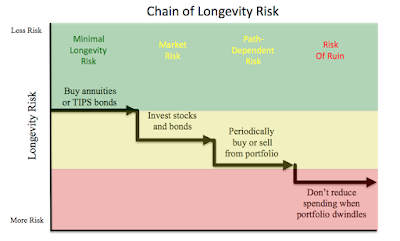 So far, our retiree’s legacy and funding portfolios are both exposed to market risk, and the funding portfolio is exposed to additional risk (path-dependent risk) once she starts spending from it. Note that this risk is introduced by the retiree’s decision to sell shares. Path dependent risk is not market risk, cannot be diversified away like market risk, and therefore we can’t be compensated for it. In general, more risk means a greater expected return, but the market doesn’t compensate us for taking path-dependence risk. Our retiree will make another decision that affects path-dependence risk, how much to spend annually. The more she spends each year, the more she exposes her portfolio to that selling-price risk each year and the more path dependence risk and risk of ruin she accepts. Simply said, a 4% “sustainable withdrawal rate” is riskier than a 3% rate. The term “sequence of returns risk” is also sometimes used to refer to the probability that a retiree will outlive his savings, which I refer to as "risk of ruin." Path dependence doesn’t cause a retiree’s portfolio to fail, at least it is not the proximate cause. Refusing to reduce spending when our portfolio declines in value causes portfolios to fail is the proximate cause of portfolio failure. This is not a market risk or path-dependence risk, but a poor decision on the part of the retiree. If your portfolio declines significantly in value and you don't start spending less, you risk ruin. Most spending strategies, like ARVA, constant-percentage spending and "RMD" rarely or never deplete a portfolio because they reduce spending as a portfolio declines in value, lowering the risk of ruin. Constant-dollar spending is the exception. That post also shows that retirees who spend a reasonable constant percentage of remaining portfolio balance each year will not deplete their savings. Their portfolio will eventually recover and spending can increase. The “RMD” spending strategy avoids ruin, as well, by dividing the remaining portfolio balance by your remaining life expectancy to calculate a safe withdrawal amount, similar to the manner in which the IRS calculates required minimum distributions for IRA's. Waring and Siegel's ARVA strategy (download PDF) does something similar. Both strategies reduce spending when a portfolio is faltering. In fact, constant-dollar spending is the only widely acknowledged spending strategy that results in portfolio ruin under reasonable spending assumptions. To summarize, our decisions can lead us down a chain of retirement wealth risk. It begins when we decide to invest some of our savings in equities. We increase risk by allocating more of our portfolio to equities and decrease it by allocating less. The next step is our decision to spend from our savings portfolio. Spending more raises the risk and spending less lowers it. The final step in the chain of risk depends on the decisions we make when our portfolio dwindles in value. Path-dependence can lead to portfolio ruin, but it probably won't if we lower spending when our portfolio is stressed. Each step we take, we add more risk. Except for the final, "overspending" step, these can all be reasonable risks to assume. Understanding them can help retirees understand how much of each risk they should accept. Great article. When you mention the intruduction of risk by including "equities" in a retirement portfolio I think you mean more than just corporate stock. REITs, bond funds, commodities, etc. would also introduce risk, no? Although I mention equity risk, the market risk I refer to is capital market risk. Equities add capital market risk, but so do the assets you mention. Once you add any risky asset to the portfolio, you introduce the possibility of outliving your savings. Excellent article Dirk. I liked the mentioning of constant percent, ARVA and RMD withdrawal strategies to minimize longevity risk along with reduced spending after poor market return years. Last 4 paragraphs brought it all home in good summary form. I need to share this with Ann. Another thoughtful and well reasoned post. Thanks, Brad. Hi Dirk, a great post! 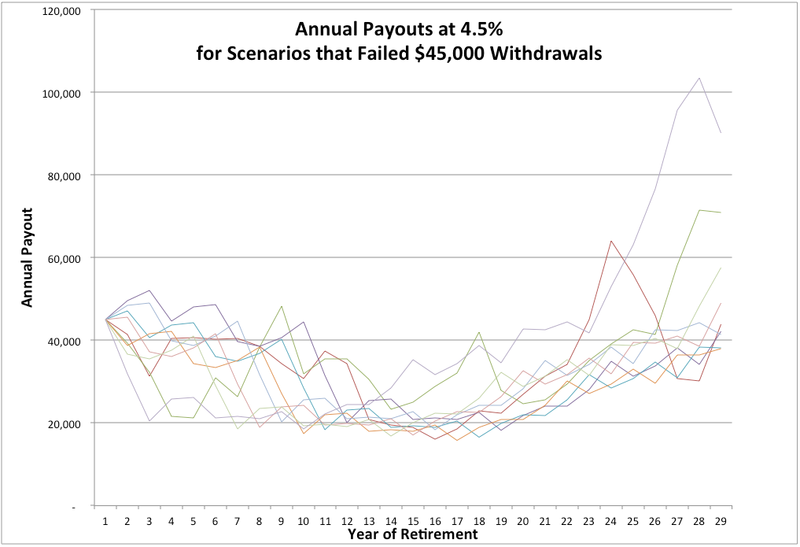 I would add that a reason for adding riskier assets, at least during earlier retirement years (60’s and early 70’s), is that the expected return allows for a higher withdrawal rate (read: higher income) relative to TIPS and annuities (I’m interpreting your life annuity to be a SPIA?). 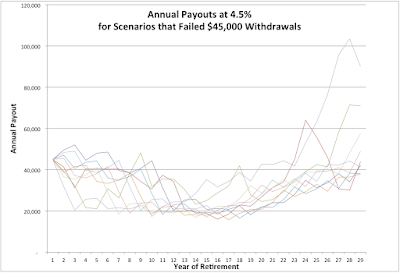 Monte Carlo simulations, when targeting a specific percentage of simulations that fail, say 10% POF for example (although the concept applies to any target POF), adjusts the prudent withdrawal rate for the volatility of those assets in the portfolio (What Returns Give, Volatility Takes Away http://blog.betterfinancialeducation.com/sustainable-retirement/what-returns-give-volatility-takes-away/ ). The greater the volatility, the more simulations that fail to reach the end of the given distribution period which I’ve always argues should come from a period life table. So targeting a POF, sets one’s failure rate just for that time period (remember you redo the calculations every year in a dynamic model), and thus sets a prudent withdrawal rate for income for that year (essentially working the problem backwards to get to the prudent income amount). SPIA’s also appear to be superior at the outset because they will always have a greater payout initially compared to a portfolio’s. However, loss of purchasing power of that fixed payout over time leads to a crossover point where income from the portfolio becomes greater, mostly from the ever shortening time remaining as one ages. Our paper (“Lifetime Expected Income Breakeven Comparison between SPIAs and Managed Portfolios,” JFP April 2014) looked at this phenomenon and saw that SPIAs work best being incorporated more at older ages beyond mid to late 70’s. Essentially, one seeks to maximize lifetime expected cash flow rather than simply how much they can get when they first retire. I’d also add that spending too much in any of the links of the chain would lead to ruin, although one could argue that this point is encompassed in the last link. However, maintaining the same portfolio balance all through retirement (implied by “portfolio dwindles”) isn’t necessary because it takes less money (read lower balance) to fund fewer years remaining when you are older, than it does when you’re younger. So, the portfolio balance can “dwindle” slowly over time and still not be in risk of ruin category (and the withdrawal rate also goes up as time shortens). Thus, each year in retirement, one needs a method to measure how much one needs to fund the years one has remaining, again referring to longevity percentiles within period life tables and determining a prudent amount to spend over that, now slightly shorter, time remaining. Redoing the income calculation each year is a fundamental tenet of the dynamic approach. Your post sets up the spherical cow description (in a good interpretation of the term) perfectly and is a great starting place to get an understanding of various points and thoughts; it’s a good new way to visualize various concerns. And then real life adjustments and circumstances make the cow "uglier." Thanks, Larry. All excellent points. A few points of clarification. When I say be careful when your portfolio "dwindles", I mean dwindles below where it needs to be, not below where it started out. You get it trouble when you spend too much after your portfolio has been battered. I suppose that, ideally, our funding portfolio would "dwindle" to near zero about the time we die. As you say, that's OK.
Like you, my gut tells me to postpone purchasing SPIA's, at least for a few years, but in fairness, Joe Tomlinson and Moshe Milevsky have some excellent arguments for buying them earlier, especially, as Joe points out, in a post-2010 capital market. (The Milevsky paper at that link was written in 2006.) I put the annuity purchase timing issue in the "Not Settled" category, but it pains me to bet against those two guys on annuities. As you know, I'm totally on-board with annual adjustments. This post wasn't meant so much as a suggestion of how to fund retirement as an explanation of how retirement finance works, the important exception being "adjust your spending as your portfolio balance varies." Otherwise, the consequences can be ruinous. Thanks for the comments, and let me put in a plug for your blog, Better Financial Education, since yours and Mike's are two of my favorites. 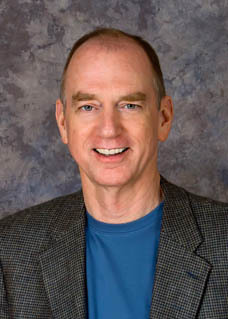 While delaying the purchase of an immediate income annuity will increase it's payout relative to the delayed purchase date (because of shortened life expectancy), delaying the purchase of a QLAC or deferred annuity reduces its payout relative to the deferred payout start date (because of lost interest and mortality credit). If one has qualified money and/or recognizes the value of longevity insurance, particularly its support for what might otherwise be a weak portfolio, buy a QLAC or DIA ASAP, not later on. Wade Pfau addresses some of this in his post today. Mike, what if one values liquidity more than longevity insurance, or values the security of a Treasury bond over the risk of a private insurer, or has a "strong" portfolio, or simply isn't ready to commit to a decision that is largely irreversible? I don't disagree with the point that delaying purchase may not be cost-effective in terms of payout, and I certainly wouldn't wait to age 85 as in Wade's example, but if that were the only consideration then SPIA's would be flying off the shelf. I would purchase one. The probability of outliving one's savings, given reasonable spending and return assumptions, is relatively low but the magnitude of the risk is potentially quite high. That combination is generally best addressed with insurance, so I think life annuities should be given strong consideration in retirement planning. But there is far too much discussion going on at present among experts for me to consider the issue settled. If you value liquidity, have a solid Floor in laddered T-bonds, and/or are over-funded (strong balance sheet/portfolio), then yes, probably don't need a QLAC or DIA, though a QLAC can still be a good way to continue to defer qualified funds and their required minimum distributions until (much) later--and can even be part of a "stretch" IRA strategy for the overfunded. If value of capital invested is an issue, buy the refund rider. With qualified money, a QLAC with a 25%/$125k limit is almost a no-brainer for nearly everyone, for at least some % up to 25%--and the earlier purchased the better. The question then becomes, beyond 25% of qualified money, and with taxable accounts, how strong is my balance sheet and should I be building a longevity allocation to support it. If so, then don't delay, do it. A weak balance sheet probably needs longevity support to some level, how much is part of the plan analysis. Likewise, someone with a younger spouse who as a survivor will lose 40%-50% of SS/pension income that has a sizable present value relative to financial capital current value probably needs longevity support. My point is that if you think longevity insurance would help support the portfolio in the later stages of a plan, then buy the QLAC/DIA sooner rather than later. It's just cheaper that way. Mike, I agree. And I assume that by "settled issue" you were referring to the narrower issue of whether waiting is cheaper. I tend to agree with you that it is not, although even Joe Tomlinson says "you need to run the numbers." Unfortunately, as you point out, this is not the only purchase criteria. When I say "Not Settled", I am referring to the entire issue of whether, when, under what conditions and how much of one's wealth to annuitize. When you consider all factors, I don't see a black-and-white answer, which is why Wade's recent post on Advisor Perspectives is so active. Thanks for your contribution here. I agree entirely with your last comment, including the last paragraph.